Beginning in 1998 to sever as a growth locomotive for China's furniture industry, China International Furniture Fair (CIFF) will start its 2015 anniversary in China Import & Export Fair in Pazhou, Guangzhou, in March, and then in National Convention & Exhibition Center in Hongqiao, Shanghai, in September. The two locations are in capital cities of the Pearl River Delta and the Yangtze River Delta, the two most important economic circles with the fastest development and greatest influence in China. Held in the largest and well-equipped exhibition complexes in Asia, The biannual trade fair will host world's prestigious brands and elites from home and office furniture, home furnishing, furniture machinery and raw materials sectors worldwide and help enterprises seize considerable business opportunities. Two Time Periods for Different Product Segments in MarchTo begin on March 18 and occupy around 340,000 square meters, CIFF's March edition will feature different exhibit themes in two time periods one after the other. The first phase of the trade fair, from March 18 through 22, will be characterized by the theme of "Whole-Home-Décor," with products to be categorized into Home Furniture, Homedecor & Housewares, Hometextile and Outdoor & Leisure. This organization reflects the trade fair's efforts on expanding exhibit lineup from indoor furniture to outdoor leisure living, as well as its transformation from a simple exhibition into a conspicuous event that provides participants a close look at trendsetting interior decoration realized with modern furniture, home decor and home textiles. Additionally, the five-day venue will also boast the widest range of classical furniture in China, as well as be the country's only that allows visitors to experience in outdoor living, with featured exhibition areas to include International Brand Hall of Home Furniture, Design Hall, Soft Decoration Sector, Custom-made Furniture and Kids & Teenagers Furniture Sector. While a bigger turnout of international exhibitors is expected, the show will offer more diversified product designs and enhance exchanges among insiders all over the world. The second phase will be held from March 28 through April 1 at the same place, with the themes of Office Furniture, Hotel Furniture, Office Accessories, Steel Furniture, Office Seating, Public Furniture, Furniture Machinery & Raw Materials. This show will be world's largest for office furniture, as well as Asia's biggest and most comprehensive one for furniture production and raw materials by linking suppliers throughout the industry. To meet strong market demand and introduce more new excellent enterprises, this session of CIFF 2015 March edition will be provided with additional Hall 12.1 to display related machinery and raw materials for upholstered furniture, mattress and cutting tools. The brand new office and hotel furniture enterprises such as U-team and Tongda will debut in the Office Show. CIFF will have a wider scale and offer more innovative products and convenient interaction. 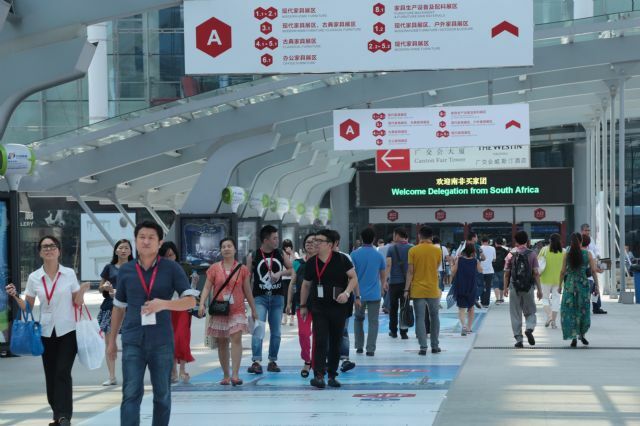 CIFF 2015 September for both Home and Office in Hongqiao, ShanghaiThe CIFF 2015 September will take place in the newly established venue of National Convention & Exhibition Center (Shanghai) on September 8-12, 2015, to be spread over 400,000 square meters. The show's exhibit themes include Home Furniture, Office Furniture, Outdoor Furniture, Homedecor, Hometextile, Machinery & Raw Materials, Fashion Design and International Brands. Quality suppliers throughout the world, including China, USA, Italy, France, UK, Belgium, Portugal, Australia and Turkey and so on, along with more than 100,000 professional visitors from over 190 countries and regions, will take part in CIFF. Numerous brands, professional purchasing groups, designer teams and industry authorities will get together in Hongqiao's modern venue, creating unlimited opportunities. Big-name Brands Flocking into CIFFWith a record-breaking scale of nearly 1.1 million square meters, CIFF 2015 will have more than 4,500 exhibitors from 32 countries and regions and 200,000 professional visitors from more than 190 countries and regions, including such domestic famous brands as Landbond, Hinglee, Kuka, Zuoyou, Qumei, Kinetic, Kinwai, Steel-land, Welon, I&D, Sleemon, Scihome, Aris, Four Seas, Frandiss, Gainwell, Noble, Fairmont Designs, Hongguxuan, Wilway, Topsun, Zhengte, Garden Art, Alma, Yatai, Jiemei, Mydeco Living, Modern Art, Kamtat, Silian, Fandi, Laifei, Link Life, Sunon, Herman Miller, Changjiang, Victory, Onlead, U-Team, Kuoching, Merryfair, Jourice, Leadcom, Hongsheng, Dechang, Homag, Nanxing, New Mas, Leggett & Platt, Lianrou, Yuantian, DTC, Taiming, Huali and Xiongyi; as well as excellent local design organizations and furniture designing companies, including Guangzhou Academy of Fine Arts, Duoshao, Norya, Free Space, Chuanshi and Darture. World's top-caliber brands of this kind, such as Ashley, Natuzzi, Chateau d'AX, Vida, HTL, Cheers, Lifestyle, Bens, Longlife, Slumberland, Meise Möbel and Koda, will also be present at the show to unveil their innovative products. CIFF 2015 Pivots Much of Global Attention in MarketSince the abovementioned information was released, the CIFF 2015 has not just attracted much attention from the global furniture and home furnishing industries, but received overwhelming applications for visit from overseas purchasing groups from Germany, Belgium, USA, South Africa, Turkey, Korea, Japan, India, Singapore and Malaysia, and from domestic furniture malls and professional dealer groups. Another proof of CIFF 2015's growing significance is that so far over 1,000 global media agencies and 500 domestic professional media have constantly followed up on the latest news issues about the show, to tell people what this year's CIFF will impress the global furniture industry with. CIFF 2015 will be held in March in Guangzhou and September in Shanghai, set to drive higher China’s furniture industry.